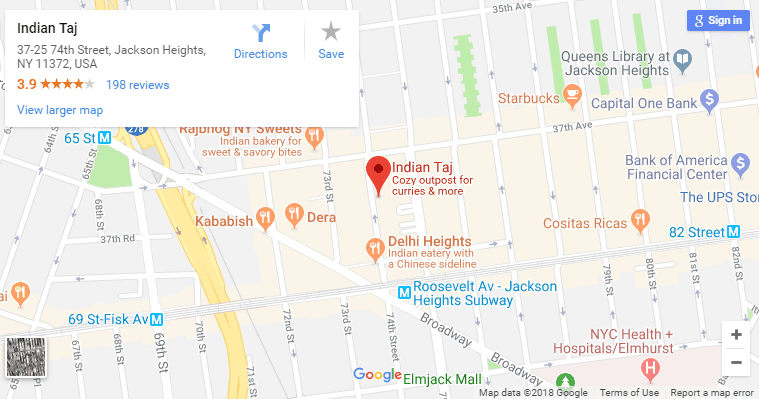 Village Voice What’s the best Indian buffet in Jackson Heights? Of the four, Indian Taj offers the most sumptuous of the all-u-can-eat lunches, at the usual bargain price of $5.95, then outdoes itself by providing dinner at only a dollar more. Highlights include a stark-red vegetarian biryani, mattar paneer that actually contains large quantities of homemade cheese, the yogurt-sauced vegetable fritters of kadi pakora, and a powerfully flavored goat curry (most buffets offer chicken, but no meat). There’s also a chat stand where fried noodles called papri can be festooned with various condiments, including homemade carrot chutney. NewYork Metro The heated competition of Jackson Heights’s bustling Indian enclave makes it a compulsory bargain-buffet destination. A couple doors down from the bigger, better-known Jackson Diner, this plucky David undercuts the ballyhooed Goliath by a buck, charging $6.95 (weekday lunch) for its all-you-can-eat feast of golden-battered vegetable pakora, mixed grill, savory goat curry, a surpassingly rich chicken mekhani (the house specialty), and a lineup of vegetables that have been cooked into fragrant, spicy submission. Remember: No doggie bags and no sharing. AOL Cityguide Head over to Indian Taj to take advantage of the mammoth 15-course buffet. This all-you-can-eat extravaganza separates the strong from the meek, and serves as a coming-of-age initiation for many a Queens native.